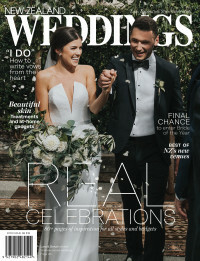 Ahead of the New Zealand Weddings Magazine Collection at Fashion Weekend, we spoke to Andy Smith – Head of Product at Barkers . The new Barkers collection celebrates the New Zealand lifestyle: relaxed and easy-going, yet distinctive and unique. Barkers are using fabrics, trims, and details inspired our epic surroundings and the special experiences to be had in our beautiful country. We spoke to Andy as Barkers prepares for the catwalk, to find out more about the relaxed yet distinctive suiting style of the brand. The New Zealand wedding not only occurs in a church but on a beach, a backyard, rural farm or urban rooftop. You could be on the dunes at the tip of the North Island, or a peak in the Southern Alps. We’re excited to provide the ultimate look for every type of wedding location, showcasing a range that is full of variety, interest and personality. We hope to inspire grooms to do something a little different to the assumed suit-and-tie look. We’re encouraging them to have some fun, show their personality… More or less roll their sleeves up and loosen the collar! We’re proud to say we’ve got a collection full of the best fabrics and styles, where all pieces can be mixed and matched to make the groom and his men look amazing on the day. We have recently included a celebrated, luxury Italian mill ‘Cerruti’ in our Made to Measure Program, which is available for the first time at Barkers. There’s a fabric, pattern and colour for every man and wedding. We have hand selected some highlight fabrics, such as luxury linen, wool, silk and seersucker. These will not only keep the groom ‘cool’ in summer, but they make an elegant, memorable statement for the confident groom on his special day. What do you hope grooms take away from the show, this year? Have fun. Be yourself. It’s advice that gets told time and time again, but for good reason. There are so many more options for the groom than just a traditional black tuxedo. Dress for you, your wedding and don’t be afraid to play with colour and texture. Try a linen or print shirt, paired with a blazer and trousers! In saying that, if you do choose a black tuxedo, it’s a classic, timeless option that will look amazing. Just make sure its tailored to you! You only get married once (hopefully). So there’s the top option to treat yourself and get a Made to Measure, bespoke suit with world-renowned Cerruti fabrics. This is your special day so relax, laugh, love and have fun without worries. Teaching my son to swim in the ocean, celebrating summer (or chasing the sun), picnicking with friends, trying to take time and slow the day down. Enjoying the little but good things in life- we live in a beautiful country, we just have to look around some times to make the most of it. Visit barkersonline.co.nz and follow Barkers on Facebook and Instagram .